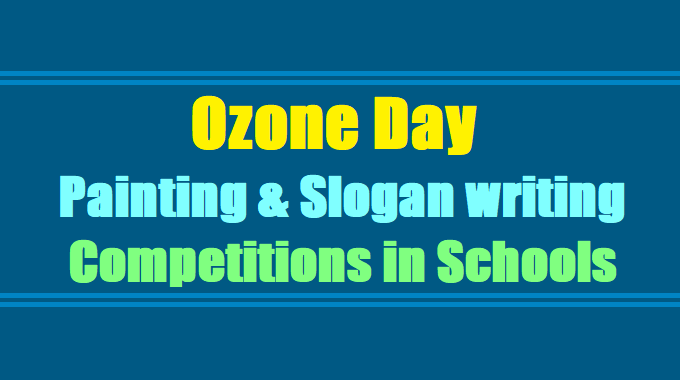 Ozone Day Competitions in the State, Painting and slogan competitions at school level regarding Ozone Day, School level Painting & Slogan writing Competitions in NGC schools, School level Ozone Day Painting & Slogan writing Competitions in NGC schools 2017. Lr.No.0009/TSPCB/ TS SCERT/EEAT/2017-18, Dt:08-09-2017 :: Sub: TSPCB - SCERT - Ozone Day Competitions in the State- Reg., Ref: D.O.No 12/1/2017/PMU-OC, MoEF & CC Govt. of India, Dt: 1st Sept 2017. With reference to the D.O letter cited it is informed that on the occasion of celebration of this years Ozone day which is celebrated on 16th September 2017, with the Theme: “Caring for all life under the sun” . In this context a letter dated 6th September 2017 from MoEF&CC Regional Office ( South Eastern Zone), Chennai a letter has received to organize School level Painting & Slogan writing Competition in the State. With the theme: “ Protection of Ozone Layer” and collect best 5 from each school . A panel comprises of 2 members i.e., one from Education Dept in the State and one representative of Department of Environment/PCB in the State to finalize the winning entries are required to be present on 14th September 2017 at MoEF&CC Regional Office ( South Eastern Zone), Chennai to finalize the winning entries under the Chairmanship of Addl. PPCF (Central) Chennai to finalize the winning entries to the Ministry to declare with applause during celebration of Ozone Day of 16th September 2017. In this context depute one Professor from State Council of Educational Research & Training, Dept. of Maths & Science HYD (SCERT) to represent from Education Dept as one of the panel member from the State to attend the meeting scheduled to be held at 2 Pm on 14th September 2017 at Chennai and TA & DA will be incurred by TSPCB. It is requested to instruct all DEOs/TSNGC District Coordinators of the State to conduct School level Painting & Slogan writing Competitions in NGC schools in the State on 11th September 2017 and selected sheets may be sent to TSNGC on the same day. SCERT Telangana - Rc.No.602, Dated: 8-9-2017:: Sub:O/o. SCERT, TS, Hyderabad - TSPCB - SCERT - Ozone Day Competitions in the state - Reg. The attention of all the DEOs in the state, kindly see the reference received from the Member Secretary TSPCB, Telangana, Hyderabad wherein he has informed that on the occasion of celebration of this year’s Ozone Day which is celebrated on 16th September 2017, with the theme “Caring for all life under the sun”. In this context a letter Dt. 16-9-2017 from MoEF and CC Regional Office (South Eastern Zone) Chennai a letter has received to organized school level painting and slogan writing competition in the state with the theme : “Protection of Ozone Layer” and collect best 5 from each school. Therefore all the DEOs in the state are requested to conduct school level painting and slogan writing competitions in NGC schools in the state on 11th September 2017 on selected sheets may be sent to TSNGC, Hyderabad on the same day, contact No. 9100269797.